Everybody has their favorite hole-in-the wall diner that’s always bustling. Plates are clanging, the waitstaff is rushing around, the same characters always sit at the counter, and the greasy guy in the kitchen is yelling, “Order up!” and pounding the little bell on the counter. Diner is a fast-playing, simultaneous action card game that attempts to replicate the frenzied feeling of a busy diner with you in the role of harried waitstaff. Does it succeed or leave you hungry for something better? Read on. In Diner, you are a part of the waitstaff in a busy diner. Your goal is to make the most money in tips by efficiently seating and serving diners in your section. You do this by collecting cards and matching them to the orders waiting in your section. If you don’t make your customers happy, they’ll complain and the manager will dock your pay by taking away points. The cards in Diner have two sides. One side shows a table. The icons on this side represent the meals you need to serve in order to make this table happy. There is also an image of a check with a dollar value on it. This is the amount of tip money you’ll earn if you successfully satisfy this table. The other side of the card shows a meal. 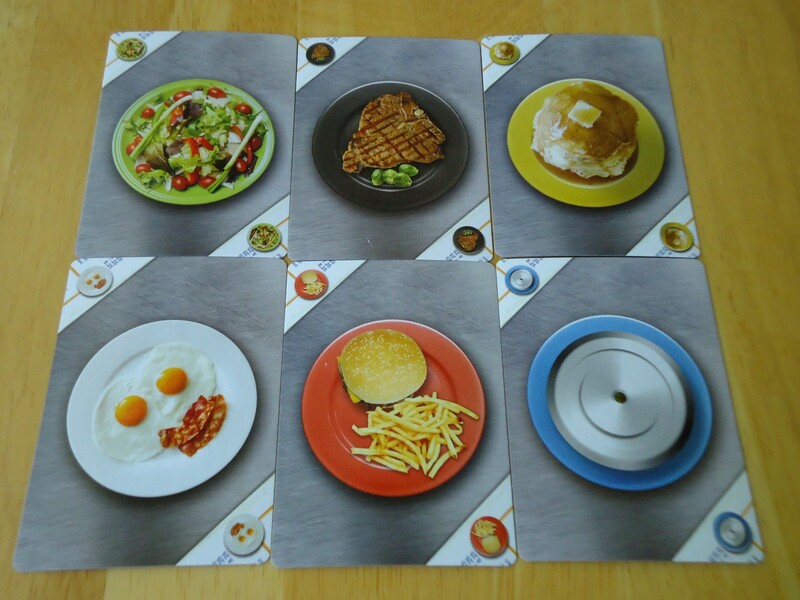 The meals correspond to the icons on the table side of the card, so if the table side shows a pancake and a salad and this table is in your section, you need to collect both meals to satisfy the table. When playing you’ll only refer to one side of the card, depending on how it is in use in the game. You refer to the meal side when the card is in your hand. These are the items you’re collecting in order to serve your customers. 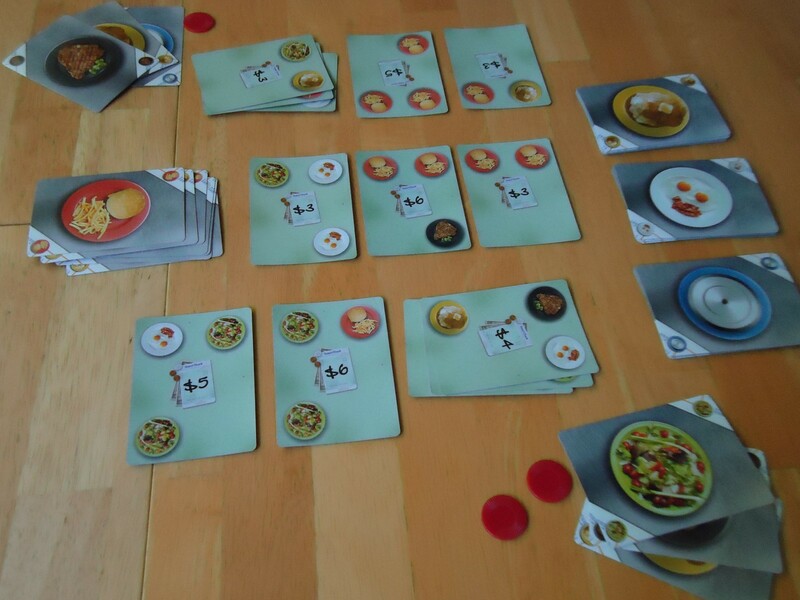 The Kitchen, which consists of three draw piles, also shows the meal sides of the cards. Cards in the Lounge, from where you take the tables you want to serve, are placed table-side up. You place the tables you want to serve in front of you (called your “Section”) and use cards from your hand to satisfy them. Once tables are served, they’re moved to your Tip pile for end game scoring. 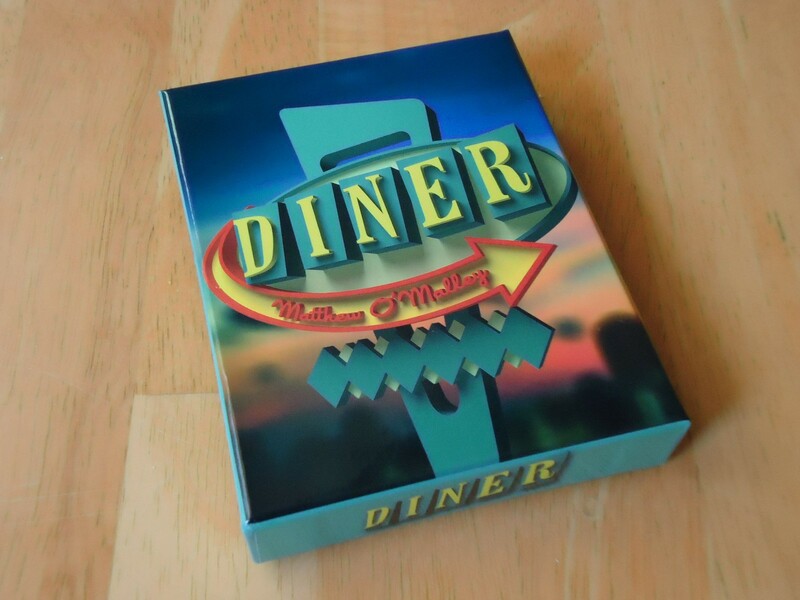 Diner is a simultaneous action game, meaning that players do not take turns and instead act all at once. Each player starts the game with one action token. When you have an action token, you may take an action. After your action, you pass the “spent” token clockwise. You are not required to take an action, even if you have an action token in your possession. You can, instead, choose to wait and hold your token(s) (or try to accumulate more) and take your actions later. This will allow you to play multiple actions all at once. If you’re out of tokens, you must wait until a token comes to you to take an action. Draw. Take a single meal card from the top of one of the three stacks in the Kitchen and place it in your hand. Seat. Take a table card from the Lounge and place it in front of you into your Section. Call out, “Seating,” when you do this. Replace the card in the Lounge by taking any card from the Kitchen, flipping it to the table side, and placing it in the empty spot in the Lounge. Counter. Take a card from the Lounge, call out, “Counter,” and place the card on the discard pile. This indicates that these customers ate at the counter. Replace the card in the Lounge by taking any card from the Kitchen, flipping it to the table side, and placing it in the empty spot in the Lounge. Serve. Reveal from your hand all of the meals ordered by a table in your section. Call out, “Order up!” and name the plates you are serving. Place the served meals in the discard pile. Move the served table to your Tips pile. 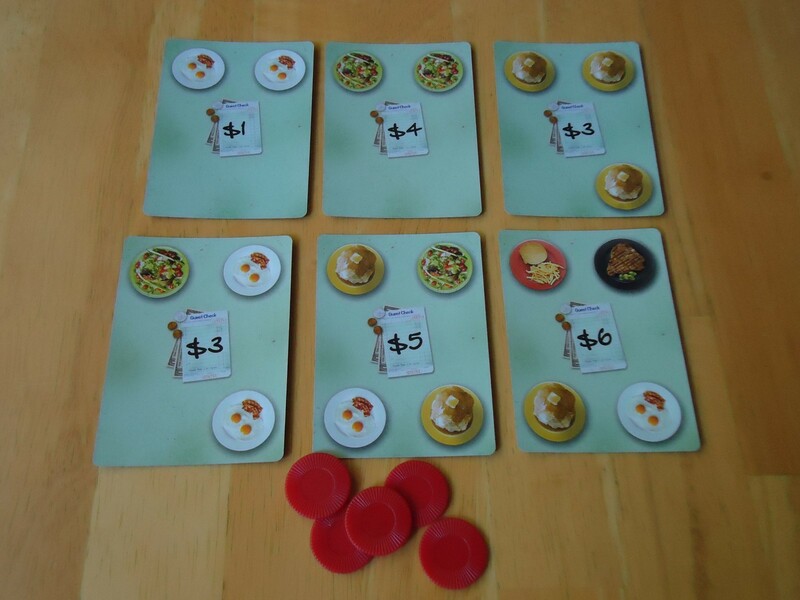 The game ends when two of the stacks in the Kitchen are empty (or the second time this occurs in a 3 or 4 player game). Any player not currently taking an action calls out, “Closing time!” and play immediately stops. Players add the value of all tables in their Tips pile and then subtract the value of any unserved tables remaining in their section. The winner is the player with the most tip money. Good Eatin’ or Food Poisoning? I’m not normally a fan of simultaneous action games. I don’t do well under stress and chaos is not my friend. I approached Diner with a bit of trepidation but I was surprised to find that I enjoyed it. I think the difference for me was the theme. The theme of a busy diner with people yelling out actions and orders is perfect for this type of game. It simulates the feeling of being in a busy restaurant with all kinds of chaos going on and it’s fun to be part of that. I think, for me, that acting out my role as a waitress took some of the pressure off of the game itself, if that makes sense. At some point, I stopped caring about winning or losing or thinking about strategy and just let the flow of working in a diner take over. The hurried pace felt like it was just part of the job, not like the game was causing stress. I may not be explaining this well but, for me, Diner stopped feeling like a card game and started feeling more like a very tiny RPG with me in the role of waitress. That was surprising and fun as all heck. Some of the meals you’ll be serving your customers. The biggest negative to the game is that there is a lot of housekeeping that has to be done and it all relies on each player remembering to do his/her chores. Passing action tokens, refilling the Lounge, and calling out all of the actions lead to a lot of forgotten items. Once the skipped item is realized, everyone has to stop and figure out who forgot to do what and get it sorted out. This slows down play and leads to some backtracking and, “Wait, what?” moments. It can also enable cheating if anyone in your group is prone to that. It’s pretty easy to take an action you’re not entitled to, particularly in the four player game where everything is moving so fast. I’m not encouraging cheating, just warning you. The better your group gets at the game the less often this happens, but introducing new players starts it all over again. I recommend playing a couple of games all the way through at a slow, turn-taking pace so that everyone can get the feel of what they’re supposed to do and when before jumping in and playing full speed. It won’t eliminate the problem entirely, but it helps. The table cards and action tokens. We actually enjoyed slowing it down and playing in turn-taking mode. Granted, this was in a two player game which takes some of the frenzy away in the first place, but taking away the action tokens and just taking turns was fun for us. It was less stressful and more thoughtful. We had a bit more time to plan and strategize. It’s not better or worse than the standard play mode, just different. YMMV, as they say, but it can be worth a try if your group isn’t into the frenetic action. Gamers should note that this is simply a fun, fast, frenetic game with some luck of the draw involved. It’s light on strategy, both because you don’t have a lot of time to think and because the cards are constantly moving around. It’s possible to hoard action tokens and give yourself a little time to think about what you want to do and then pull off a large combo of actions, but the risk in this is that everything you want passes by before you can utilize it. Hoarding tokens can also anger your opponents because no one else can do anything if you’ve got all of them! Of course, the opposite can happen. You can spend all your chips only to see something great appear on the table and you can’t buy it! There is a balance to be struck between blowing all your chips and keeping some back just in case. Mostly, though, you’re just grabbing cards and reacting to what appears on the table. There’s some strategy in choosing which tables you think you can serve, but if the cards don’t break your way you won’t succeed. You need some luck to win. The rules are short and simple. What I really enjoyed about the game was that I felt like I was being challenged on two levels: physical and mental. I was trying to collect the sets that I needed and keep my opponents from getting high scoring tables, but my ability to do it fast was challenged. There are plenty of set-collection games out there, but not too many that make you do it quickly. It’s one thing when you have all the time in the world to think through your choices. It’s a vastly different game when you have to do it fast as well as accurately. It was frustrating at first because I felt like I was having to train my brain to do both things at once, but once I got the hang of it, it was a lot of fun. Diner is just crazy fun. It’s not a brain burner, but it is a good time. The theme really shines through, particularly if everyone in your group is good at calling out actions and gets into it. It’s a great warm up for game night, to pull out at parties, or to play with non-gamers. This one will be staying in my collection. 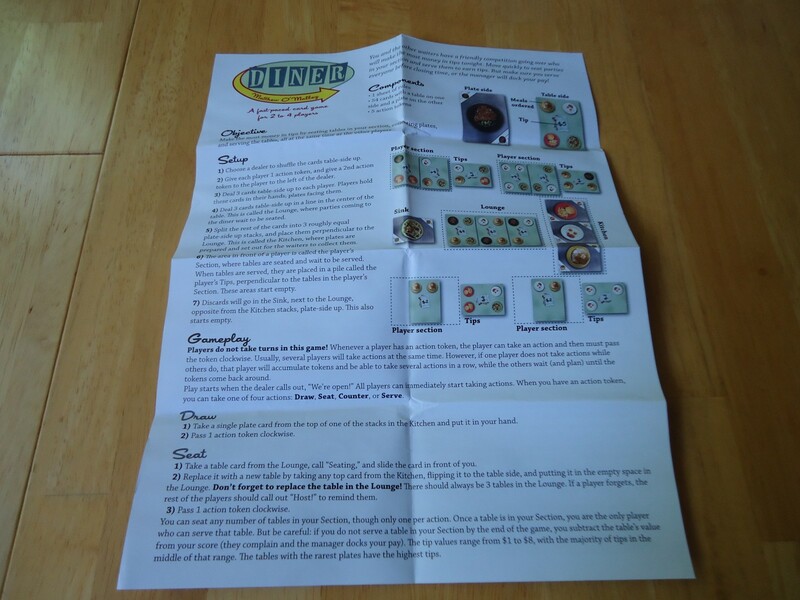 iSlaytheDragon.com would like to thank Dice Hate Me Games for providing a copy of Diner for review. Play style simulates the theme of a busy diner so well that it starts to feel like a very tiny RPG. Easy to learn, good for non-gamers. Light on strategy, but it balances your ability to think with your ability to move fast. Can be slowed down and played in turns without breaking the game if your group wants to cut down the chaos. If you're not fast, either physically or mentally, you'll struggle. There's a lot of housekeeping, some of which gets lost in the frantic play and can lead to "Wait, who did what?" moments that slow things down.